The Ninety Stool brings beauty and consideration to an often overlooked part of the stool – the foot rest. This product is about paying particular attention to the unique intersecting footrests and ensuring this detail is both newly functional and aesthetically pleasing. The leg and footrests connect at exactly 90 degrees to each other and are made as one element, creating a beautifully blended and sculpted modern joint. In contrast, the second joint of each footrest is raw and expressive of its classic mortise and tenon construction. When the three legs of the stool are assembled to support each other and create stability, the footrests naturally sit at an angle to the floor. This angle produces a varying footrest height ranging from 200 to 300 millimetres, which not only creates a beautifully stepped intersecting detail but also allows the user to find the perfect ergonomic height to rest upon. "We knew we wanted to design a stool that was created using a combination of both modern and classic furniture-making techniques, explains Vitamin co-founder Andy Vernall. "We also wanted to look at creating a more ergonomic product, designing it around how people really use stools - perching and repositioning themselves to find comfort." The wooden components are cut using a computer-controlled milling machine, then assembled and finished by hand. The product comes fully assembled and is initially available in ash, finished in a variety of colours or natural wax. The result is a delicate but distinctive intersecting footrest detail that not only gently tweaks the expected stool typology but also creates a comfortable and adaptable product. 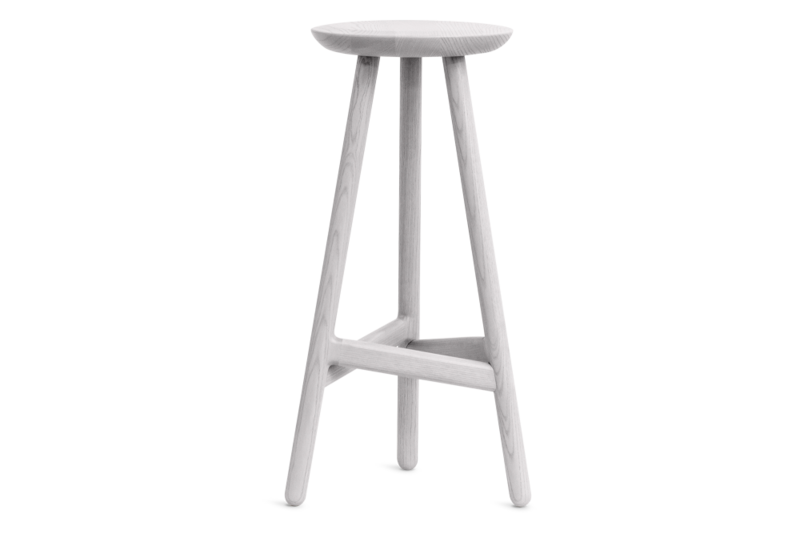 This design is a modern interpretation of a classic stool silhouette, so it will be at home in any bar, restaurant or kitchen no matter how modern or traditional.